The Past couple of week have been pretty hectic for me. 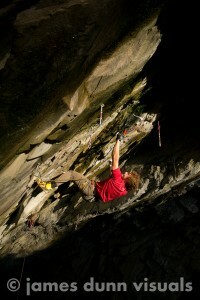 I was climbing with my Austrian friends for a while, then after that it was time for the BMC International Meet. During this time I met some awesome people from around the globe, climbed some awesome routes and had a totally brilliant week. I have done a fair few routes since my last post, and I’m out in Kandersteg at the moment, so I’ll probably do a fair few more. 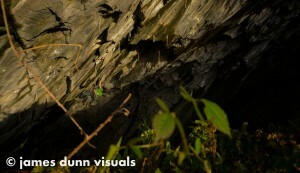 But for now here is a list of my most recent ascents and a little info about one or two of them. -The Hyperventilater IX/10 (FA) – Just before the International Meet Will and I headed into Lochain to bag a quick route on the Sunday before the weeks hosting commenced. 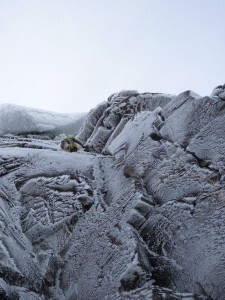 The route takes the steep faint overhanging crack line on the left wall of the Vent (to the right of the “Big Daddy Corner”). The route is still waiting a clean ascent as on my last ground up attempt, I came off one move from the easy ground. But pulled back on and finish the route. 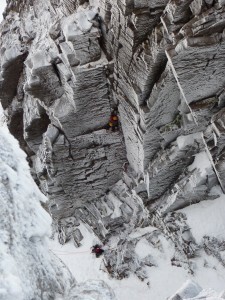 The second pitch takes the obvious large corner above and right of the terrace. 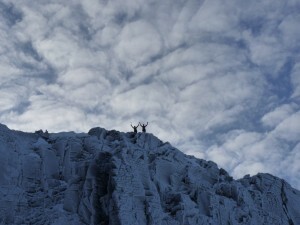 After the international meet, James Dunn and I headed up the Ben for one last route before I nipped off to Switzerland. 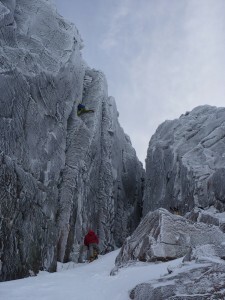 We managed to make the second ascent of the well renowned aid route that Dave Macleod had freed a few years ago “Don’t Die of Ignorance” XI/11. I had had two attempts on the route on Friday with Jen, but dropped my axe (knocked it off its placement while placing a cam) on my onsight attempt. 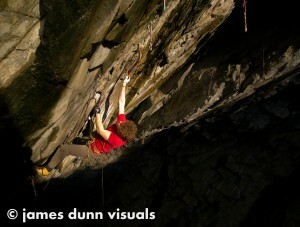 Then on my second go I pulled trough the crux but the tiny hold I was using ripped off and the attempt was over. 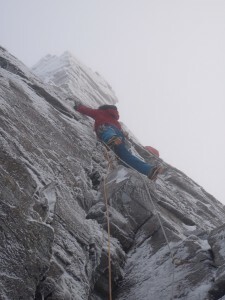 But you know what they say – “Third time lucky”, and surely enough, Incident free and fairly smoothly, on Sunday James and I made the second ascent of “Don’t Die”. Me entering the crux of "Don't Die"
I was psyched to get the route and even though I was truly gripped and terrified on the cruddy, thin and super technical snow/ice wall above the crack, I was pleased to really enjoy the climbing (once it was over). So as I said earlier, I am In Kandersteg Switzerland at the moment for 8 days. So keep an eye on my blog for updates on what Adam Russell and I are getting done. 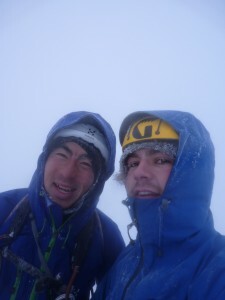 On Thursday night Will and I headed up to the Cairngorms for a couple of days cranking. We met up with Adam Booth and our Austrian friends Charly Fritzer and Matthias Wurzer for a good day in the hills on Friday along with Simon Yearlsey and Mark Chadwick. 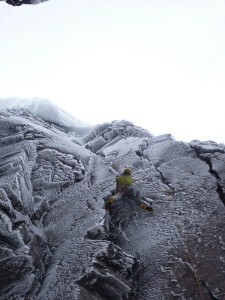 We headed into Lochain to find some good conditions and faultless weather. Will, Adam and I made an ascent of the brilliant line of “Daddy Longlegs” and then went on to watch Adam cruse “Fallout Corner” in one long pitch. Whilst Adam was on “Fallout”, Will and I watched Charly and Matthias cruise Pic’n’Mix” on the pillar. 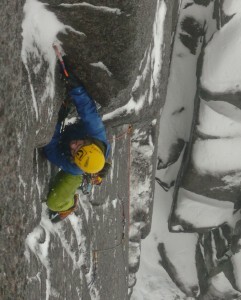 Charly led the crux pitch in roughly 10 mins with very little effort and impeccable style. 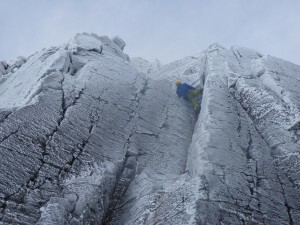 On the Saturday Will and I made the second ascent of Guy Robertson and Pete Macpherson’s route “The Gathering” also on the pillar in Lochain. This was a really good line which was home to some deceptively steep and technical climbing with the crux pitch packing a punch at the end. Me on the first pitch of "The Gathering"
Will on the second crux of "The Gathering"
I thought the route was a fair bit harder than “Pic’n’Mix” but not as hard as “Omerta” so the grade of VIII/9 is probably spot on. We had met up with Justin Tracey and Jenny Crook on the Friday night who where in the Gorms for some photography and filming antics. They managed to film our entire ascent of “The Gathering”, so watch this space for more info on that soon. Finely on Sunday after a relaxed start, Will and I walked into a super busy Lochain for the third day in a row to find the buttresses had turned pretty black in places. We wondered up toward Y-Gully in search of some whiteness and found a cool looking line up the right wall of Y-Gully left branch. We weren’t sure if the route had been climbed before, but Will set off to have a go. 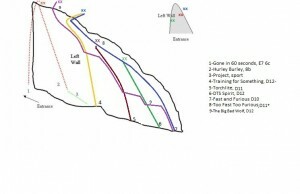 The route turned out to be a super fun and enjoyable line going at around grade VI/6. It was a good day and a good way to end the short trip to the Gorms with some cool climbs and fun people. So yesterday it was sendage all round at the Newtyle cave. I headed back with Adam, Harry Holmes, Joanna Lisowiec and as James had sent his project (Torchlite) earlier in the week, he came along as the token photographer. Most of us had routes we had been trying and we individually readied ourselves for some sending action. I warmed up on the top half of my project and felt surprisingly good through the crux section and onto the headwall. But I knew fine well that when I reached this point from the ground after 20 meters of climbing it was going to feel a little less straight forward! After this, whilst James was scuttling around setting up ropes for a day of filming, I belayed Adam on “Torchlite” while he warmed up working the moves so that he had it dialled for is redpoint later in the day. During this time Harry and Joanna headed outside to the lower routes to get warmed up and get some millage ticked before venturing onto the steepness. Once Adam was down, my turn was swiftly approaching and those pesky redpoint butterflies where bouncing around in my stomach. 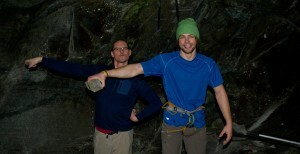 I jogged down to the lower routes to ask Harry if I could grab a belay off him when he was free. I was going to need two belayers and two ropes on my route to reduce the rope drag caused by the wandering nature of the line. The run back up to the cave definitely got the blood flowing and cleared my head, and once I was tied into the sharp end I felt ready and psyched for the send. I set off up the first moves feeling good and after a couple of annoying mistakes I had joined the steep line of “Torchlite”. I moved up this line feeling not too pumped and found myself reaching the point where I would break out left into the crack of “Training For Something” and swap ropes. After this came the crux, which I had never climbed through from the ground before, so I was psyched to pull through the huge moves to reach the upper pod on “TFTF”. At this point I was totally boxed and my forearms were pumping with lactic. But I focused on the lip of the head wall and charged off left back into the steepness. I then found myself with only one hard move to do before I was on the slab and I could almost taste the victory. But it was not meant to be. Feeling pumped and a little flustered I moved up and clipped the second last draw, only to realise that when I moved up I had knocked my tool out off the placement where I had left it below and it plummeted to the ground. After 35 meters of climbing, my attempt was over. I’m not going to repeat what the next words where that came out of my mouth, but I will say that I probably wasn’t much fun to be around for the first hour. 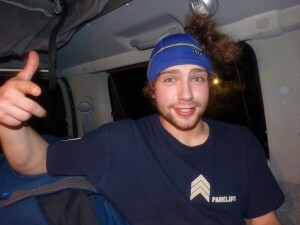 But it was still early in the day and Adam was psyching himself up for battle. He also set off from the ground looking calm and psyched. This seemed to pay off as he managed to tick “Torchlite” with very little effort and got the ball rolling for a day of success (although at this point it didn’t feel like it to me). After about two hours I decided that it might be time to give my route another go. But in the back of my mind I didn’t have much hope for this attempt. I felt more tired than when I left the ground the first time, plus I had never climbed through the crux, before my last attempt never mind twice in one day. But I tied in again and set off up the steepness for the second time. This time I managed not to make the silly mistakes that I had on my first go and despite feeling like I had less power in reserve, I definitely wasn’t feeling as pumped as on my first attempt. 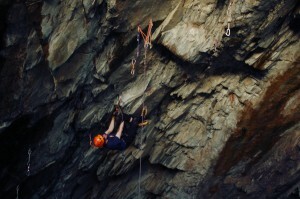 This gave me a new found confidence and before I knew it I was swapping ropes again on the tenuous hook, and then charged into crux section ready to give it my all. I soon found myself at my previous high point and this time I was not going to drop my tool! 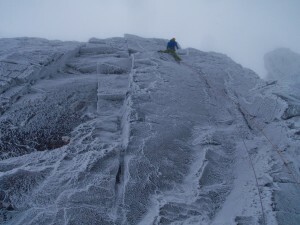 I reached up over the lip to hook the tiny flake, then swung my foot up and rocked over onto the slab. 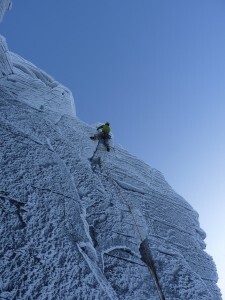 Even though the lower unclimbed section of the headwall had been bolted and the placements drilled years ago, the slab section was left natural (apart from the bolts), with thin hooks on edges and in cracks. So even though I had passed the steep climbing, I still needed to keep it together on the tenuous section to reach the chains. But this all went to plan and I was soon lowering to the ground with the redpoint high flowing through me. “The Big Bad Wolf” D12*** was ticked. With Adam and I having ticked our routes. It was down to Harry to get his route “F&F” to finish off the mass day of sending. And this is exactly what he did. Having only had a couple of shots on the route before, and having never linked the crux section, It was very impressive to see him cruise through the lower half and move smoothly through the crux to reach the last clip. After a bit of huffing and puffing (as to be expected) he finally clipped the chain, and the route was his. It was awesome to see everyone get their routes in the cave yesterday, and it was also good to see that psyche and enthusiasm definitely rubbed off on each other, helping us get our routes. Since my last post about “Stone Temple Pilots” I have had a couple of fairly interesting (wet) but successful ventures into the mountains and one failed attempt at a new line. But on every occasion I have had good fun and a laugh with my mates. So as always, it was well worth it. Firstly, Will and I headed into Lochnagar to attempt the well known line of “Crazy Sorrow” which is a hard line going at the fierce grade of IX/10. Unfortunately this attempt was short lived due to the conditions, so Will and I headed off in search of a plan B. We ended up climbing all the independent sections of “Scarface Wall” VIII/8 up to the point where it meets “Straight Jacket” and then decided to rap off and head home. There was also talk of this being the second ascent of “Scarface Wall” but as we did not do the whole route, this isn’t the case. But what we did was good fun and helped salvaged the day with some awesome climbing. I then went on to meet up with Ian Parnell for three days just before Christmas. Unfortunately the weather forecast was hideous for this period, but we did manage to get a route done in the mountains before it totally crapped out. 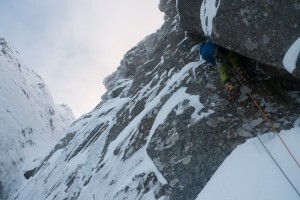 Ian, James Dunn and I headed into a very wet Loch Avon basin to climb a quick hit on Carn Etchachan on the first day. 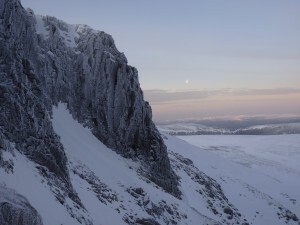 When we arrived at the top of the crag in the morning before abbing into our route, the whole crag was very white and in perfect winter nic. 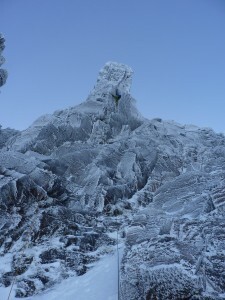 But we all knew the forecast was to get very warm, so we swiftly got stuck into some new routeing on the awesome face. Me reaching the belay on the FWA of "Jumping Jupiter"
We made the first winter ascent of “Jumping Jupiter” which is a techy summer E2 that takes a boldish slab and two roofs. I lead the first pitch which turned out to be strenuous in the first section and then bold and technical in its upper half. 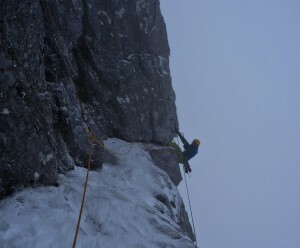 Ian went on to try the second roof pitch, but after some impressive attempts, the sharp end was handed to me. I also tried to head through the capping roof directly above the belay. 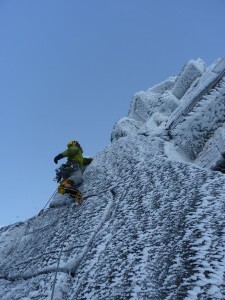 But as the temperature was rising I decided to turn the roof on the left, climbing the arête. 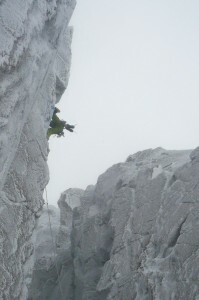 I then made a rising traverse up and right to regain the summer line and finished as for that. This turned out to be a very fun and techy VIII/8 and helped us salvage Ian’s venture North with a route in the mountains. After the route in the Gorms we headed back towards Fife the next day and stopped off at Newtyle quarry for a couple of routes and a bit of training. With the weather looking warm still for the next day, we opted for a pumpy training session in the tooling cave at my house. This was a good way to end the three day hit and also helped me tire myself out before the Christmas relaxation started. After dropping Ian off at the airport, I headed home and hung up my tools for a couple of days while the festive activities of eating and sleeping took over. 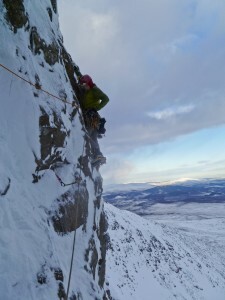 Since Christmas I have only had one day in the mountains, and this was a failed attempt at a route in Lochnagar with Guy Robertson. Even though we didn’t manage to get our route ticked, it was fun to be out in the hills and good to blow away all the crimbo cobwebs. All good except for the fact that I found out that my camera was buggered from the wet day on Carn Etchachan with Ian. Which wasn’t ideal! 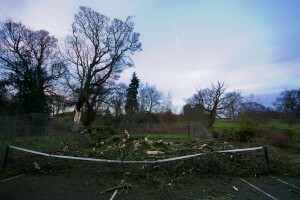 Since then the weather has been very bad with super high winds and fluctuating temperatures that seem to be causing havoc in the mountains and at sea level. So recently I have spent most of my time in my training cave and also decided to re-open up the wonder project in Newtyle cave. Having had a couple of session in the cave, I am starting to feel fit again and hopefully will get my project sent before the winter arrives in Scotland for round two of sendage!